In October 2017, the City of Kalamazoo’s recycling program converted from a dual stream program (glass, plastic, and paper had to be separated into 18-gallon bins) to a single stream program (all recyclables can be mixed into a 96-gallon cart). This change led to an immediate increase in the total amount of recyclables collected. 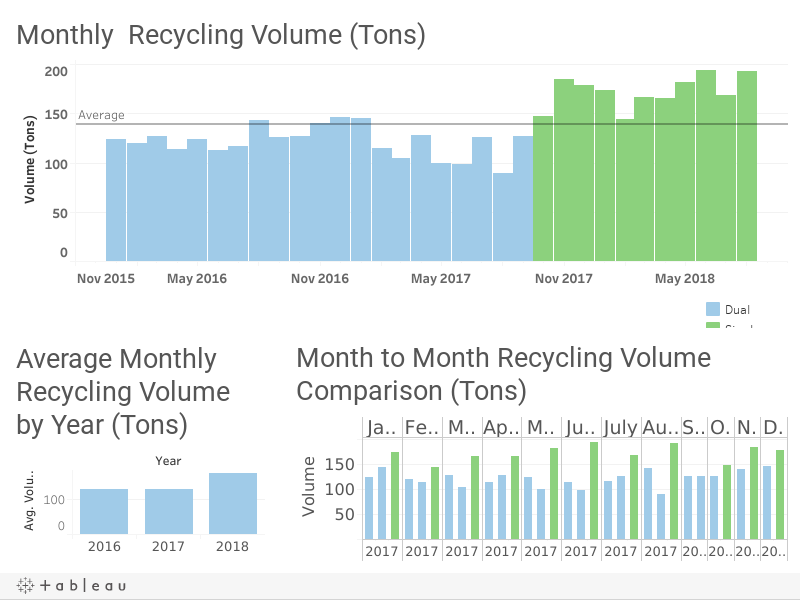 Average monthly recycling has increased nearly 42% since the change (average monthly recycling volume January 2016 – September 2017, 121.66 tons; average monthly recycling volume October 2017 – August 2018, 172.73 tons). If you are not currently participating in the recycling program, you can learn more and request a cart at no cost by visiting www.kalamazoocity.org/recycling. City residents are also encouraged to download the Recycle Coach app for iOS and Android devices to get additional recycling information, personalized calendars/schedules, and alerts about the City of Kalamazoo's residential services.